10.0 Torchlight Procession with Band from The Plain to Five Fields. 1st June: Tea & Entertainment for the old folks at the Village Hall by the Ex-servicemen’s Club. Numbered Programmes cost 3d. A prize of one Guinea awarded to the lucky number drawn. 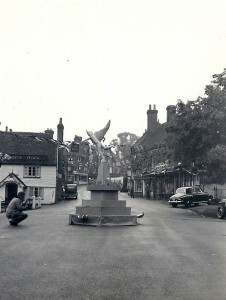 In the weeks before Coronation Day people had begun to decorate their houses, shops and businesses. The streets were hung with flags, shields, banners and bunting. 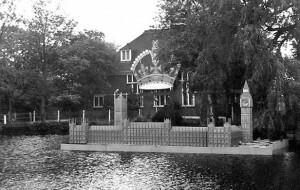 On the village pond stood a model of the Houses of Parliament constructed by Mr Anthony Coleman. The model was 28 feet long and was stood on a raft which had piles sunk into the bottom of the pond. Big Ben was a working clock that lit up at night and the whole model was floodlit. Another of Mr Coleman’s creations was a model of the statue of Eros. 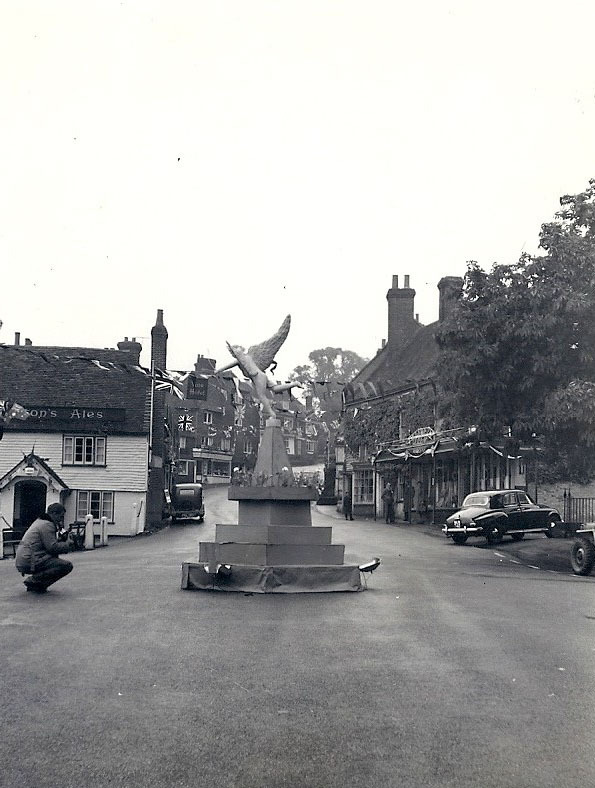 It was at first sited by the old Westminster Bank for passers by to see and then, on Coronation Day, it was moved to the middle of the Plain to create Goudhurst’s own Piccadilly Circus. Behind the Houses of Parliament, and in front of the Village Hall, stood a giant crown, which was also illuminated at night. It was crafted by Mr Ronald Wright and his band of helpers to the specifications of Commander Millson. 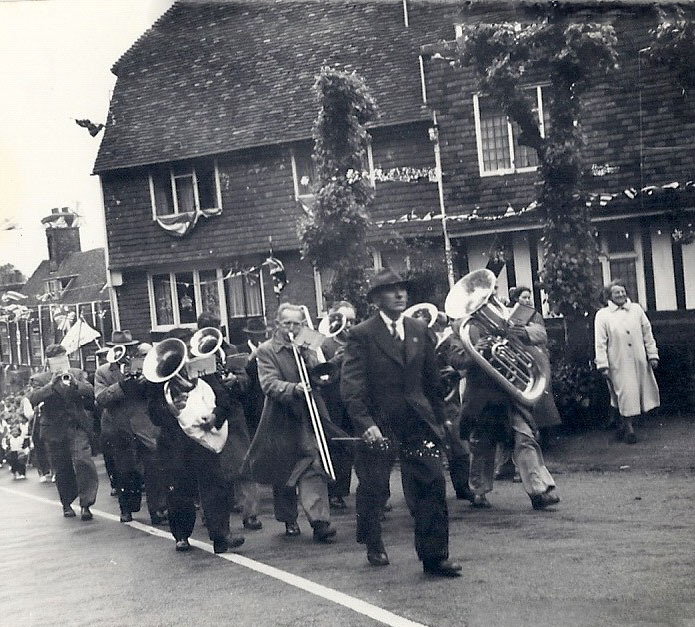 Goudhurst’s celebrations for the Coronation began a day early. On 1st June the old folks of the village were invited to a tea and entertainment in the Village Hall. The event was provided and paid for by the Ex-Servicemen’s Club. Coronation Day itself dawned disappointingly grey, cold and wet. Celebrations began with the ringing of the church bells at 8 am. Members of the village’s organisations and societies started to gather on the Plain and, at 8.30 am, led by the Village Band, they marched to St Mary’s Church for a service conducted by the Vicar, Canon A. W. MacMichael. By the time the service was over the rain had stopped. The parade re-formed outside in Church Road to see a new flag raised on the church tower while the National Anthem was sung. At around 9.45 am the parade and others in the congregation moved on to Maypole Green to watch the planting, dedication and fixing of commemorative plates to the Coronation trees. Next it was time for the Coronation Service broadcast on the radio and television. A television had been set up in the upstairs room of the Ex-Servicemen’s Club and some villagers were able to watch the service as it happened, many seeing television for the first time. Others listened to it on the radio. Sports for the children had been planned for 2 pm in the Vicarage Field. But, the rain had started to fall again so the sports were postponed until the 6th June. The children’s tea, which had been arranged by the W.I., should have followed at 4.15 pm in the Vicarage Field. But, the weather did not improve so the tea was moved indoors to the Village Hall. At around 5 pm the Carnival entries gathered for judging on the Plain. However, judging was difficult outside because of the wet weather, so as much as possible was done in the Village Hall. There were 14 classes to be judged including fancy dress and decorated prams, bicycles, cars and lorries. 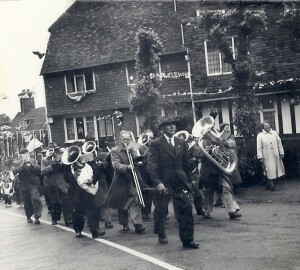 Eventually the rain stopped and the Carnival Parade was able to process from the Plain to Maypole and back as planned. Some fancy dress outfits were very flimsy but the entrants braved the dismal conditions. By now the village was crowded with villagers and visitors and everyone, carnival entrants and spectators, thoroughly enjoyed themselves. Bert Brown, of Weekes Bakers in the High Street, had baked and decorated a giant cake for the celebrations. It stood four tiers high, weighed 206 pounds and was topped with a crown. The cake had been on display by the old Westminster Bank for everyone to see and admire. Then at around 6.45 pm the cake was cut by Goudhurst’s Queen for the day, Amanda Large, and pieces were distributed to the waiting crowd. At 7 pm the Carnival prizes were presented. A special prize was awarded to the youth of Lurkins Rise for their entry “ Soldiers of the Queen”. About 40 youngsters from Lurkins Rise had dressed in matching trousers, shirts, waistcoats and hats and marched in the Carnival procession carrying their banner between two poles. At 9 pm it was time for the Queen’s broadcast from Buckingham Palace which was relayed by loudspeaker to the crowd on the Plain. This was followed by dancing round the pond. Finally, at 10.00pm, the Band led a torchlight procession from the Plain to Five Fields where a bonfire was lit and a fireworks display was set off. By 24th June the committee had raised £368 in funds of which £14 was contributed by visitors to the village in appreciation of the decorations and illuminations they had enjoyed. The committee had not had the final expenses bill by then so were not sure whether they had sufficient funds to cover it. To make sure they did not have a deficit they arranged a Mammoth Whist Drive on 27th July. If they still had a deficit after that they would arrange a big dance in the autumn which, if it became necessary, they were sure would raise enough money to cover the final bill.